After lengthy process European Union finally issues verdict, will label Jewish produce in move branded 'anti-Semitic' by Israel. The European Union has approved a measure labeling Jewish-made goods from Judea and Samaria, in a long-anticipated move branded by the Israeli government as "anti-Semitic." At a meeting in Brussels, the European Commissioner "adopted this morning the interpretative notice on indication of origin of goods from the territories occupied by Israel since June 1967," the EU's executive said. The notice is effectively a set of guidelines for labeling products from Israeli communities in Judea, Samaria, the Golan Heights and neighborhoods of Jerusalem liberated during the 1967 Six Day War. The first instructions are set to be for food and other industries, including potentially specifying the wording to be used on labels. Israel's ambassador to the EU warned on Tuesday that there would be "implications" from the decision. The Israeli foreign ministry, meanwhile, has summoned the European Union's ambassador to the country in response to the move. "Israel condemns the European Union's decision to label Israeli goods originating from over the '67 lines," the foreign ministry said in a statement following the decision. 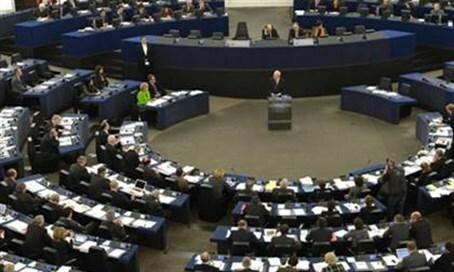 "We regret that the EU has chosen, for political reasons, to take such an exceptional and discriminatory step, inspired by the boycott movement, particularly at this time, when Israel is confronting a wave of terrorism targeting any and all of its citizens," it added. The foreign ministry further condemned the "shocking double-standard" of labeling Israeli goods in disputed territory, while not acting similarly in "some 200 territorial disputes current going on throughout the world." Meanwhile, the EU insisted Wednesday that the decision is "technical, not political." "This is a technical issue not a political stance," European Commission vice-president Valdis Dombrovskis told AFP, adding that the bloc "does not support in any form a boycott or sanctions against Israel." Dombrovskis said the labelling decision was related to consumer policy in the European Union, the world's biggest economy with a combined population of over 500 million. "The Commission is providing guidance to the EU member states and economic operators to ensure the uniform application of the rules on indication of origins of Israeli settlement produce," he said. implementation of the existing EU legislation." Ahead of the ruling, the NGO Monitor watchdog warned moves to label Jewish-made goods in Israel - even from only a specific part of the country - were being engineered and encouraged by far-left NGOs as a precursor for more extensive boycotts against the Jewish state. "The European Union’s decision to label Israeli-made products from beyond the Green Line is another act in the ongoing NGO campaign to delegitimize Israel," NGO Monitor head Professor Gerald Steinberg of NGO Monitor said. "This strategy is also the driving force of BDS (boycott, divestment and sanctions) campaigns, and it is led by EU-funded NGOs that are detrimental a peaceful, negotiated solution." NGO Monitor outlined how extremist NGOs whose only agenda was to attack Israel were being funded by the EU itself, and that those very groups were behind the latest measure. "For years, the EU has given money earmarked for humanitarian aid and peace-building to political groups that abuse human rights to promote their own agendas. These organizations have lobbied hard for the EU to adopt their ideas, with the rhetoric of 'consumer choice' masking what is clearly an anti-Israel measure," the group said in a statement. "NGO Monitor research shows that NGOs push labeling as a first step in the BDS process, aimed at all Israeli products and services. This allows these NGOs to talk about the pre-1967 lines while actually targeting Israel within the 1948 borders." "The multiplicity of examples shows that many highly political NGOs are not only following the EU’s decision to label products, but that they were active in shaping the resolution and promoting it as a step in their long war against Israel,” Steinberg added. "The EU and its member countries are the primary supporters of many of these BDS-related NGOs. This support is inconsistent with Europe’s claims to promote international values and human rights."